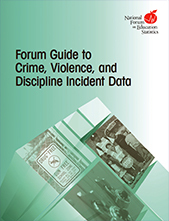 The Forum Guide to Crime, Violence, and Discipline Incident Data focuses on the use of crime, violence, and discipline data to improve school safety. It presents strategies for implementing an incident database, including system design, management, and training; recommends a body of data elements, definitions, and code lists useful for collecting accurate and comparable data about crime, violence, and discipline; and offers suggestions for the effective presentation and reporting of data. This guide was created in collaboration with the Discipline Data Working Group of the U.S. Department of Education to ensure that it will be useful to states and districts reporting data to the Office for Civil Rights, the Office of Safe and Drug Free Schools, the Office of Special Education and Rehabilitative Services, and EDFacts.